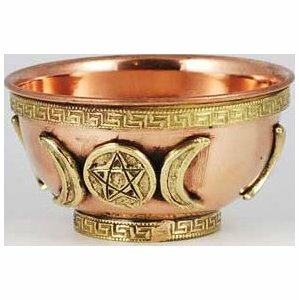 A 3 inch copper bowl adorned with four brass triple moon (with pentagram) accents representing the three phases of the goddess; the Maiden Mother, and Crone. An elegant vessel for altar offerings and ceremonial use. Made of natural copper therefore the color may vary.